A native of the state of Michigan, Rob graduated from Harbor Beach High School where he was a 3 year starter on the basketball team as well as the football, baseball, and track teams. After high school graduation, Rob continued his education by attending Delta Jr. College in Midland Michigan where he played guard on their basketball team. In 1967, Rob was drafted into the United States Army where he served in Vietnam with the 2nd /34th Armored Division. a position at WPRE Radio in Prairie du Chien, Wisconsin as a DJ and Sportscaster, announcing local and statewide high school sporting events. 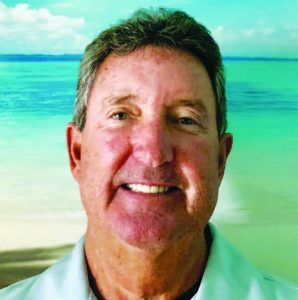 It was in Prairie du Chien that he earned his nickname, “Radio Rob:’ In 1975, Rob began his basketball officiating career by working in the Wisconsin Interscholastic Athletic Association (WIAA) and the Wisconsin Intercollegiate Athletic Conference (WIAC). In December of 1984, Rob gave up the Wisconsin winters and moved to San Diego where he immediately joined the San Diego County Basketball Officials Association. He was an active member of the SDCBOA for 25 years, serving two terms as President and several years on the Board. Rob was also instrumental in developing the Mentor Program. During his officiating career, Rob worked many CIF championships and one State Championship game in 2000. He was a Division I Women’s Official from 1987 to 2012, working the Pacific 10, Mountain West, WAC and West Coast Conferences. He was also a dedicated member of the CCAA, the GSAC and the SCIAC Conferences from 1988 to 2010. In 2010, Rob joined the North County Basketball Officials Association where he worked his final game as a referee in February 2017. Rob continues to support local high school officiating by mentoring new basketball officials and working as a clinician at several local basketball camps. Since his retirement, Rob has served the San Diego CIF as a basketball official’s evaluator and liaison to their selection committee. He also served as an official’s liaison for the past two NCAA Regional tournaments that were held in San Diego. Including his Wisconsin officiating, Rob has refereed basketball for the past 42 years. He currently lives in Rancho Bernardo with his wife of 30 years, Liz Mullarkey.